The root of Horseradish, Armoracia rusticana, is a traditional culinary spice used with meat and fish. Leaves can be used in salads. Rich in Vitamin C and minerals. An antioxidant. Approved by German Commission E as a remedy for bronchitis, coughs and urinary tract infections. Soothes mucous membranes. A folk aphrodisiac in Europe. The dried leaves produce a yellow dye. Horseradish is a native of eastern Europe and prefers a rich, loose, moist soils in a open, part-shaded position. Produces clusters of tiny white flowers in the spring and summer. Drought and frost resistant. A perennial plant growing to 0.6m. Not suitable for container cultivation. 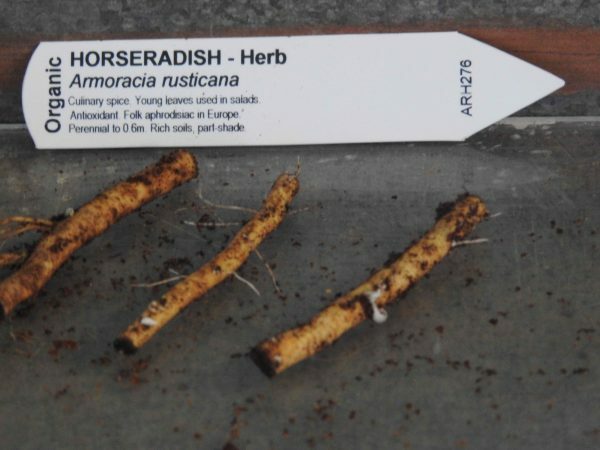 Be the first to review “Horseradish, root cuttings” Click here to cancel reply.